choir croak out them goodies: Winter! In the middle of May, I had the opportunity to see Tel Aviv's Vaadat Charigim support Froth on their Los Angeles tour date (more on this later). 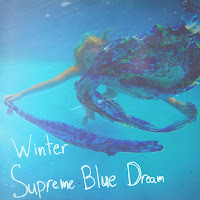 The show's lively opening act, Winter, was unexpectedly grabbing, and though well-fitting among a nostalgic shoegaze lineup, the group's 24-year old Brazilian frontwoman, Samira Winter, was unusually, well, happy, considering the typical romantic or introverted qualities generally offered by the genre. Winter is awfully reminiscent of the Sundays in the most wonderful way; their leader is never not smiling -- maybe she's high? Maybe she's had a near-death experience and is merely grateful? Whatever her deal may be, Samira Winter appears to love life and it comes out in her persistent smile. Truly, the girl never stops smiling while she plays. So this positively elated band, led by Samira Winter, put out a record in March, and lyrically it's like a Best Coast record, told with a hint of co-dependence ["I thought I knew better/And stray from your tricks/You use and abuse me/Why can't I resist?/You're my drug/Cause you're my drug," from "Pretender"], or maybe just the desire for real friendship [refer to one of many ambiguous songs in "Flower Tattoo": "Say, say you love me/Say you're my friend/Just stay no going"]. But then, there're these happy-go-lucky options, like "Crazy" ["You make me feel funny/Shivers in my body/Hanging out with you/What about some ice cream?/Walking down the street we'll scream and scream/I don't care about what other people think"]. Winter is this perfectly childlike, childish, youthful, innocent manifestation of honest love, whoever might be on its receiving end, and it's all so very joyous in spite of the longing in its stories. 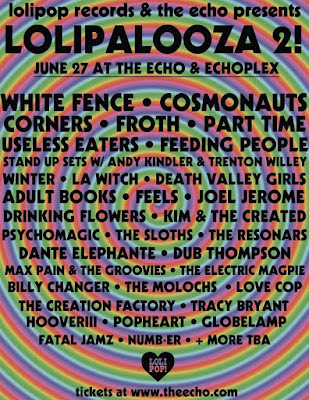 Anyhow, come see them when they play this lengthy shindig in Los Angeles, come July. 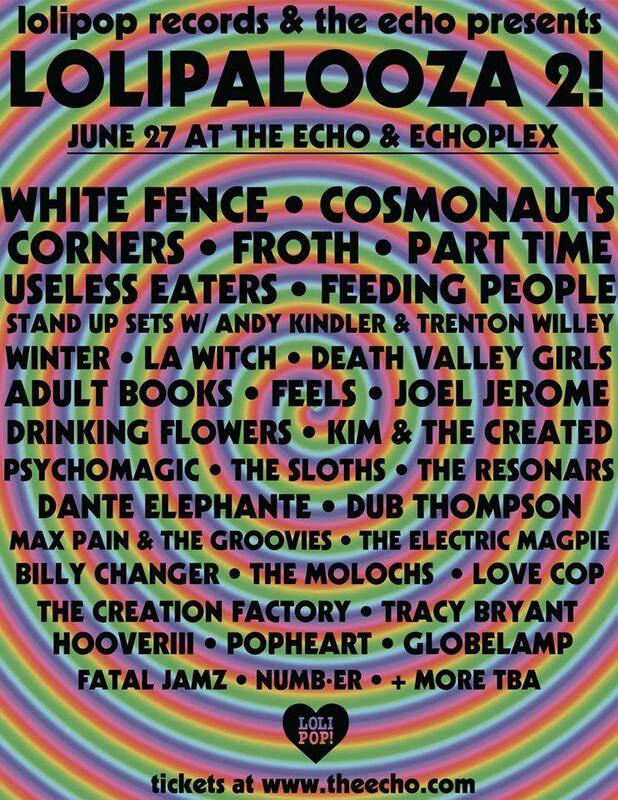 A lovely lineup all around, really!